Emerging from the wake of his sold out release with Zehnin Records, Paleman continues his experiments with textural and visceral modular music exploration for his debut 3 track EP for Nonplus Records. A side “Sweltering Rain” is a powerful piece of groaning, urgent dance floor minimalism, charging forward with a ritualistic, undulating droid line set against scorched, otherworldly drones. B1 “Cells” opens with scurrying modulated white noise and reverberating cosmic texture patterns set against a monolithic kick drum ostinato. The elegant minimalism develops with radioactive analog synth alarms and stark futuristic vocal glitches as the track barrels forward with momentum. B2 Titan Vulture explores an undiscovered alien landscape evoking imagery of liquid pools of methane, erupting geysers and swirls of otherworldly elements. It is an absorbing, chugging and captivating piece of textural escapism, evolving as it goes whilst still featuring the elegant and considered minimalistic touch that runs throughout the EP. 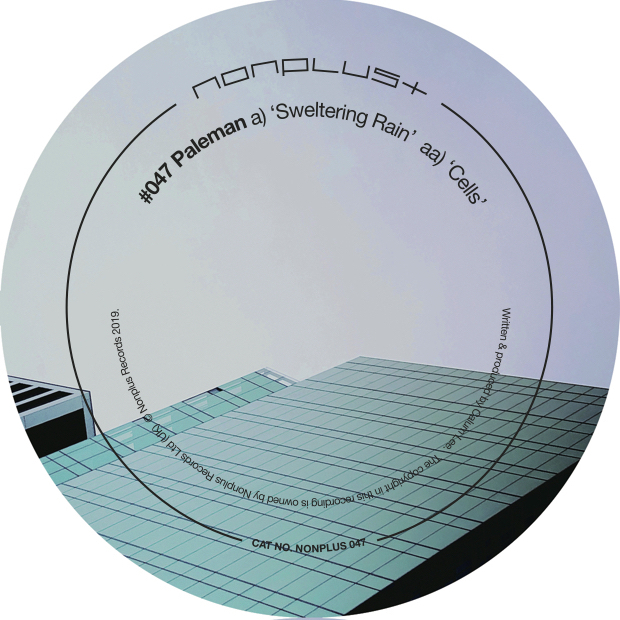 This EP sees Paleman returning to the physical dance floor based music he is known for, but undoubtedly reflects strong developments in writing approach, quality of sound and exploration of new techniques. 2019 seems set to be a flourishing year for the young producer.